I don’t venture to Leith very much, so my knowledge of its gluten free cafes is not as extensive as it should be. However, on an early morning visit, Printworks Coffee on Constitution Street was a great recommendation from my friend over on the excellent The Finest Cut whisky blog. The first thing that struck me in this Leith cafe was the service – friendly, professional and really helpful and welcoming. The cafe serves good quality teas and coffees, plus soups, lunches and a brilliant selection of cakes. There are gluten free sandwiches, toasties and the soups are largely GF too. The gluten free cakes are brought in from bakeries and the selection looked amazing. In talking to the staff, I was shown the bread and the allergen information on the wall – they are taking our health very seriously here! 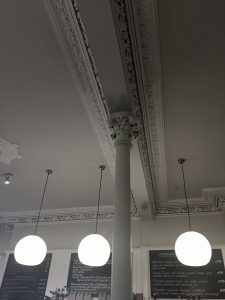 Add to the food selection, the eclectic mix of furniture and the stunning plasterwork on the ceiling, and you have yourself the ideal Leith pitstop for the coeliac or gluten intolerant coffee fiend. 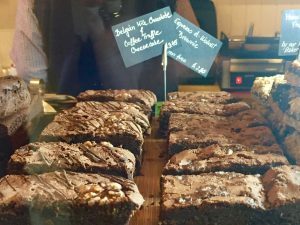 The cafe is not just dog friendly, it also has canine regulars and clearly knows its locals too – as I sat there, a steady stream of people passed through, all picking up their delicious looking takeaways and coffees. On the day I was in I spotted some good looking GF brownies, an “espresso and walnut” brownie and some gorgeous macarons. You will be well looked after and spoilt for choice at Printworks, so add it to your Leith itinerary.